My correspondent Mr K made a delicate comment under my 'Stage and Page' post, concerning the work of Ed Ruscha. You can find out more about Ed Ruscha here. 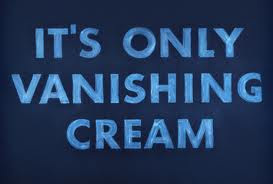 In the meantime, I bring you It's Only Vanishing Cream, 1973. Shellac on satin. Mr Ruscha is, as you might have guessed, a real favourite of mine. I've got more books on him than probably any other artist. His 'Two Galleons' are my screensaver. And, at his retospective at the Hayward last year, I spent an inordinate amount of time just looking at and marvelling at his work - I say this because I don't often get that feeling in galleries. Another of his gnomic sayings I relate to is: "I'm forever darting from one side of the room to the other. Sometimes, four days will go by (in my studio) and I've just kind of, like, piddled." The only thing I can't seem to come to terms with is his name. It's pronounced ROO-SHAY. Though I always think of him as rhyming with PRUSSIA.